Earlier, the commission has released the Indian Economic Service & Indian Statistical Service Examination (IES/ISS) 2016 Exam and invited the applications. A large number of candidates applied for the examination. All the candidates appeared in the examination successfully give the examination on the particular date and timings as provided by the commission. The examination was held in the month of May. Those candidates are eagerly waiting for the results. The Union Public Service Commission (UPSC) has declared the Indian Economic Service & Indian Statistical Service Examination (ISS/IES) 2016 Exam on the official website of www.upsc.gov.in. The qualified candidates in the written exam have appeared for the interview in the month of July. All those who had appeared for the personality test might be waiting for the result declaration ever since. Now as the results are out, the candidates can access them on the main website. The list of recommended candidates for the posts was displayed on the result page. The date of joining would be intimated in due course to the shortlisted candidates. Interviews of shortlisted candidates were duly completed were properly completed in the month of 7th July 2016. The latest news is that the sum-total marks of written test and the personal interview has been processed, and the Final result announced. The candidates must have to follow the steps to check the result. The first step is to open the official website of www.upsc.gov.in. 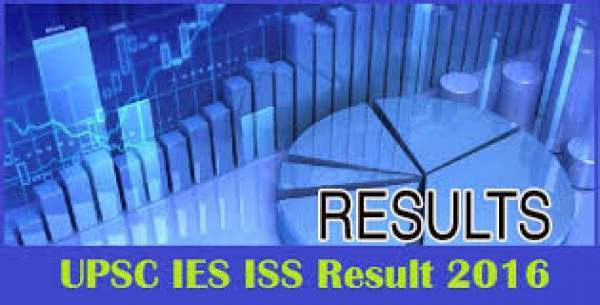 Click on the link ‘ISS/IES Final Exam Result 2016’. The result will be displayed on the screen in PDF. Aspirants can check the result and save it. Applicants who appeared in the Personal Interview for selection into central government economic and statistical services. They can check the result by searching for their respective roll number.